“Redd” the new pirate in the Pirates of the Caribbean attraction around the world will be availabe to interact with guests at Disneyland! As you may be aware, the famous bride auction scene in the Pirates of the Caribbean has already made its transformation to a chicken auction. Yes, a chicken auction. The new scene debuted a change for the famous Redhead. She went from a beautiful victim to a somewhat empowered Pirate who encourages the men to drink more rum. Soon the new Pirate “Red” will begin mingling her way through New Orleans Square near Pirates of the Caribbean in Disneyland. I would assume that she will appear after the Disneyland version of the ride completes its refurbishment in June 2018. Well, if I needed friends, they’d call me Redd. Pirates call me ‘Rrr’ for short. I been ‘round the world, but the sea is always home. Do you know Captain Jack Sparrow? That Sparrow owes me a new ship. Wouldn’t be surprised if he found himself in irons once more. If you see Mister Sparrow, I’m lookin’ for ‘em! 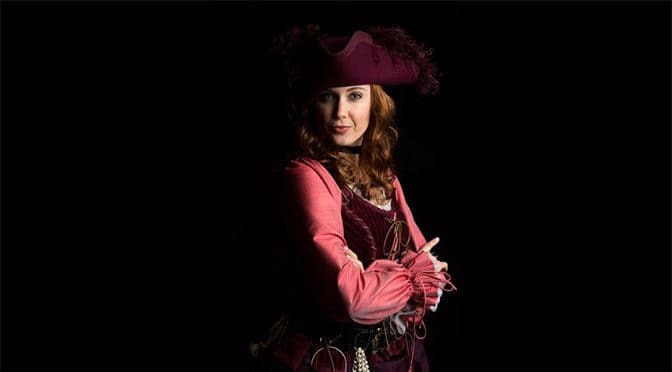 Some pirates think it’s bad luck to have a woman aboard a pirate ship. What do you think? T’is far worse luck not to. What is treasure to you? Coin o’course! I accept it all—Spanish doubloons, English farthings, French livre, Dutch lion dollars and Portuguese moidore. Are you looking forward to meeting guests in New Orleans Square? I s’pose. I be searching for brave sorts of recruits for a few little ventures. M’ only love is profits, dear. Redd will be adventuring through Disneyland’s New Orleans Square this summer. Previous PostRoadster Racer Goofy is coming to Hollywood Studios as Handy Manny leavesNext PostRey has begun meeting guests at Disneyland!